Easy to use video conversion tool. Is there a better alternative to Forty-Two DVD-VX Plus? Is Forty-Two DVD-VX Plus really the best app in Video category? Will Forty-Two DVD-VX Plus work good on macOS 10.13.4? Forty-TwoDVD-VXPlus is an easy to use video creation tool for Mac OS X. Easy to use interface for converting media. You do not need to be an expert to start creating great quality video. Let Forty-TwoDVD-VXPlus do the hard work for you. It has a familiar interface which is easy to understand and get around. Create video for your digital life. 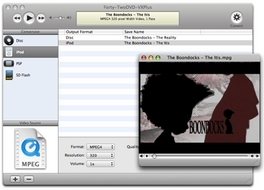 Whether it's video for portable devices (iPod, PSP etc...) or making digital copies of your favorite movie or scene, Forty-TwoDVD-VXPlus does all the hard work so you can easily create high quality video. Version 3.3: Release notes were unavailable when this listing was updated. Forty-Two DVD-VX Plus needs a rating. Be the first to rate this app and get the discussion started! Many supported formats. Support for most popular video formats as well as DVD and VIDEO_TS sources. Queue list & batch converting. Add multiple source files, select your options, start the conversion. Forty-TwoDVD-VXPlus will process all of your files without any user interaction. Built in media player. Easily view your input source or converted media with the integrated media player. Great feature to verify your input source or selected DVD/VIDEO_TS options. Device integration. Copy your converted videos directly to a PSP or SD Flash card. Burn Disc related media to CD-R or DVD-R. Import iPod format video into iTunes.